One of the biggest takeaways I’ve gotten from all of this time I’ve been spending in Silicon Valley is that everything in California closes early. Offices become ghost towns at 6:00. Most Happy Hours end at 6:00, maybe 7:00 if you’re lucky. Bars stop serving at 1:30 AM and worst of all, most restaurant kitchens close at 9:00. If you end up working late ’til say 9:00 or later you’re pretty much screwed when it comes to getting a decent dinner. In all of my digging, I have thankfully found a few places that keep their kitchen open ’til around 10:00. 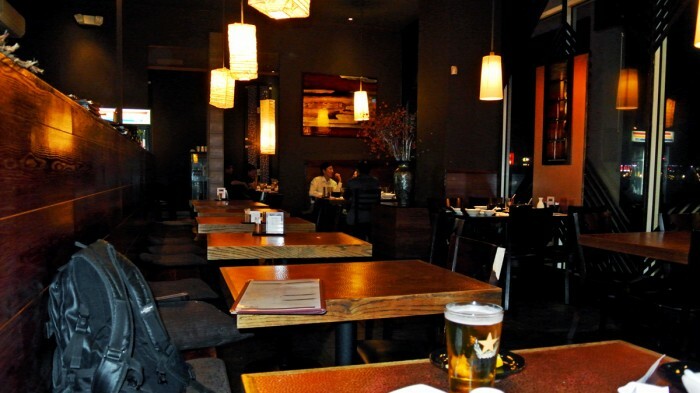 But there is one place I’ve found in Santa Clara for quality late night dining called En Japanese Tapas Restaurant where the kitchen stays open until a glorious 11:30 PM. On this particular evening, we arrived at around 10:15 PM hungry and exhausted. We needed a good meal and some drinks stat. The restaurant was still bustling when we arrived and there were in fact a number of additional guests that arrived to dine even after us. The crowd was mostly Asian, which definitely gave me a good feeling about the place in general. It was a very clean, open space with high ceilings, wood paneled walls, and standard Japanese decor. We ordered a pitcher of Japanese beer and a carafe of hot sake to kick it off. Domo arigato Mr. Roboto. With drinks in hand, we made our dinner selections and patiently waited as they were prepared and brought over as each dish was ready tapas style. Considering this was an izakaya, which is essentially a Japanese pub, there were certain dishes that would ordinarily be strange picks, but are pretty safe bets in this environment. I began my meal with a Japanese delicacy, a dish called Ankimo. It’s actually monkfish liver which I’m sure is a scary ingredient scary to some. Not to me, it was a must-have. 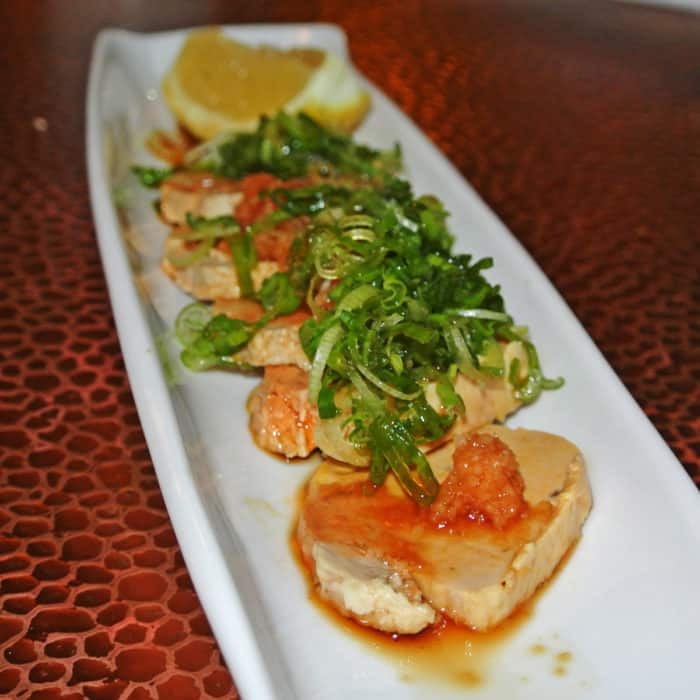 The liver came in thick, pink, pate-like slices and was served in a pool of ponzu with green onion slices, a grated daikon topping called momiji-oroshi, and a lemon to squeeze. It definitely had the unusual texture often associated with offal, but it was actually rather mild flavorwise. Each creamy bite retained its structure leaving a clean and subtly minerally aftertaste. It’s not for everyone, but I’m into it. 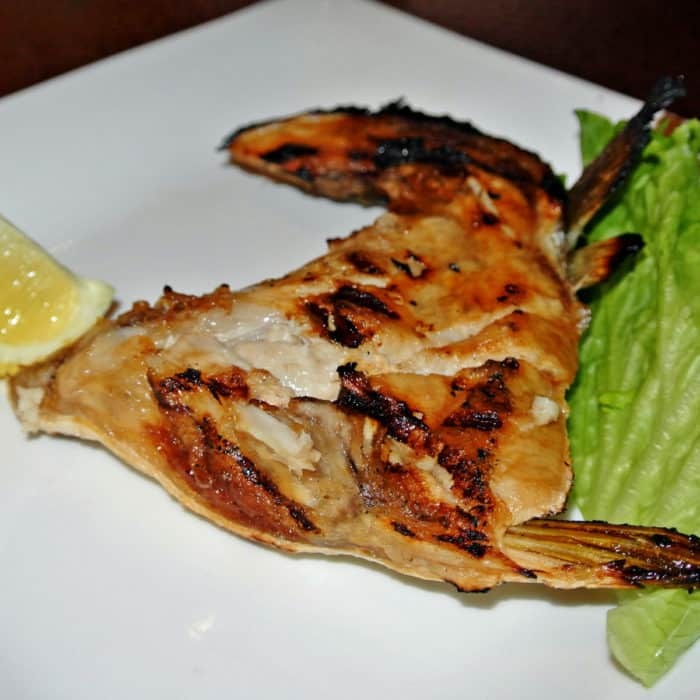 Next, I had the izakaya staple known as Hamachi Kama aka roasted yellowtail collar, which when done right is one of my favorite dishes in any cuisine. This version had really crispy skin with plenty of white fish meat underneath, but I think it was cooked a little past how I like it. The usually delicate white fish lost some of flaky layering during the cooking process which detracted from its distinctly enjoyable texture. Not a perfect rendition, but still quite tasty and served me well at this late dining hour. As my third and final tapas course, I selected the White Tuna Tataki. These large hunks of fresh fish were just barely seared on the outside leaving the inside beautifully raw and untainted. 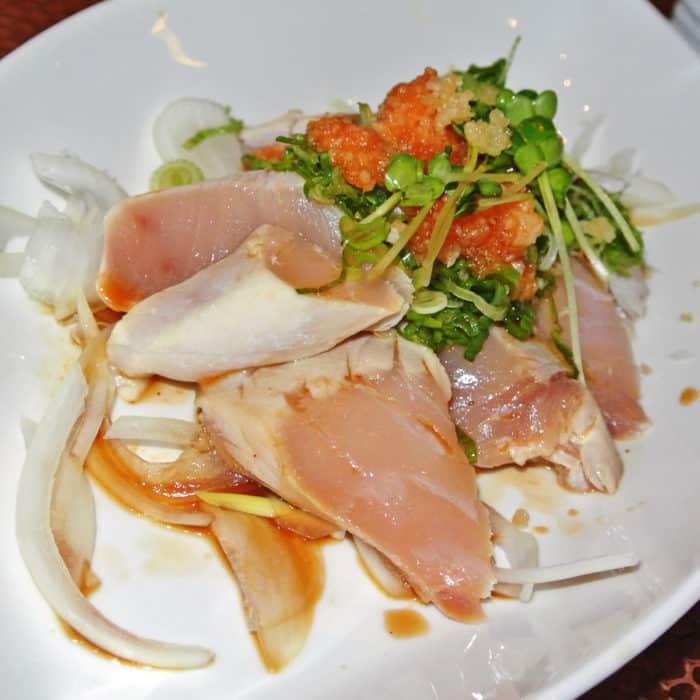 Served simply with ponzu, green onion, and more of that grated daikon topping this dish also let the quality and flavor of the raw fish shine. It was simple, clean, and absolutely delicious. 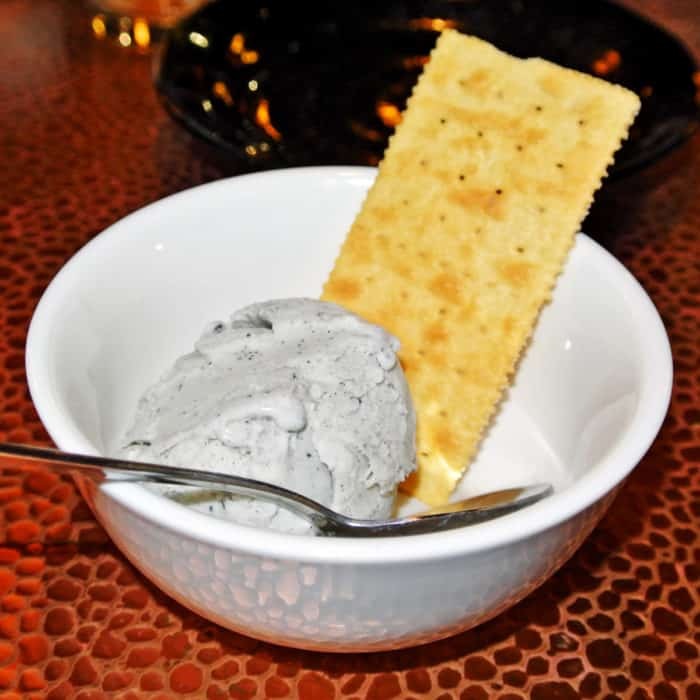 To close out the meal, one of my dinning companions ordered some Black Sesame Ice Cream for the table. I don’t often eat dessert because I don’t obsess over sweets, but black sesame ice cream is a different story. There’s very little sweetness, just a whole lot of nuttiness and creaminess to this variety of ice cream. And this was an excellent rendition. I think it was the perfect conclusion to an izakaya meal. 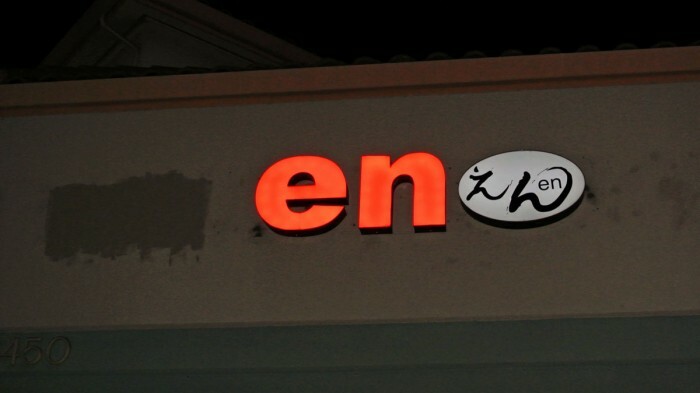 So if you’re in Silicon Valley and are in desperate need of a good meal after 9:00 PM, head to En Japanese Tapas in Santa Clara. 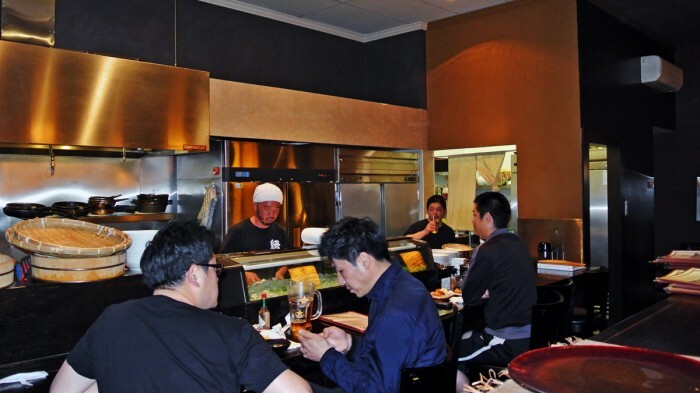 With their miraculously open-late kitchen and delicious izakaya food you’re sure eat great, even late. Know any other great late night eateries in Silicon Valley? Let me know in the comments below.